Around le globe: Mother's day and Plitvice. Happy Mother's day!Well, at least for Australia. And apparently the U.S...? Celebrating the women who give so much to their children; sacrificing, chauffeuring, cooking and comforting. Not the best picture but ; pancakes topped with bananas, blueberries, honey and cinnamon. Accompanied with a blueberry/banana/raspberry smoothie! I love my mum very, very, much. She's a wonder woman basically. I don't know what I would've done without her! I also translated my love into baking. I made her pancakes for breakfast! The past few years, I always used the pancake mix because I didn't know much about making food. Now I find the package mix rather sweet. I'm making pancake mix from scratch forever and ever! Think about how much sugar and additives they add into the package mix.... Think about how you can make fluffy pancakes that is so easy!I don't even add any sugar to it, I top with honey and cinnamon (I'm a cinnamon freak) always! 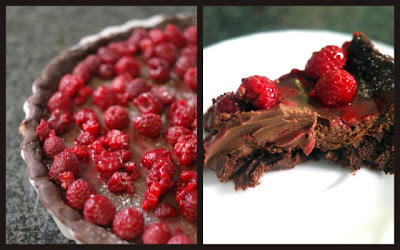 Well, I now bake quite often so I decided to make a decadent chocolate tart! Cutting it isn't so easy, but the taste is pretty good! To continue on with my Europe posting, after I visited Bosnia, I went to Plitvice, Croatia. The drive from Bosnia to there was horrible. Bumpy, windy road, oh and the worst thing happened. I didn't feel well, and motion sickness and me... I threw up. Don't worry, there were plastic bags on the bus. But yeah, worst part of the trip. Enough said. Back to Croatia. Croatia is really beautiful. Plitvice is a national park, possibly one of the most amazing and stunning national parks I've ever been to. I'm not sure whether Yosemite in the States is prettier, it's not really debatable for me because , they're both so beautiful. And I wish I had more time to explore around both places. In Yosemite, I would've loved to go hiking, gone to more spots. In Plitvice, we didn't spend enough time there! Plitvice has about 1209841038201 waterfalls.I don't know the exact number, but all I know is that there are tons of waterfalls over there. Big ones, small ones. You name it. There's a wooden path where you can walk on, which is really nice because it's so close to the water! The water is absolutely clean, some parts are pristine blue. There's a lot of flora, but I didn't see much fauna. No bears or anything :( I would've loved to see a big brown bear. Trying the slow shutter effect! Always beautiful with moving water. I think we only explored around the park for a few hours before heading to our hotel. And dinner. The next morning, we went to Zagreb, the capital of Croatia. So disappointed we didn't spend a lot of time in Plitvice, because can I say that there is nothing to do in Zagreb??!?! Or at least the tour didn't take us anywhere interesting in Zagreb. It's just like another European modern city. All I remember was going to this museum thingo, eating apple strudle , visiting a cathedral and nearly falling asleep while listening to the tour guide. I was tired. This photo is rather embarrassing. But Croatian girls are so pretty! My parents and my aunties, Yi Yi and Yi Ma spent pretty much half an hour in a souvenir shop. Yi Ma was debating about which small plate to get. After weighing out the advantages and the disadvantages, she decided to get one plate. But just as she was about to pay, she suddenly said "Wait!? Which plate did I pick1?!?!?" We all had a good laugh! I mean, after half an hour of deciding which plate to get, you forget which one you even chose! Yi Ma can be so funny sometimes!! Beautiful -- those pancakes look delicious! That's my kind of breakfast! Thank you so much! Pancakes are my favourite things to make for breakfast. I am actually planning to make your banana waffles on your blog, love your recipes!